Last month infoDiagram turned three years old since our full service. And it’s been amazing years so far. If you wonder who’s behind infoDiagram, how it all started, this is a good occasion to learn more about our roots. 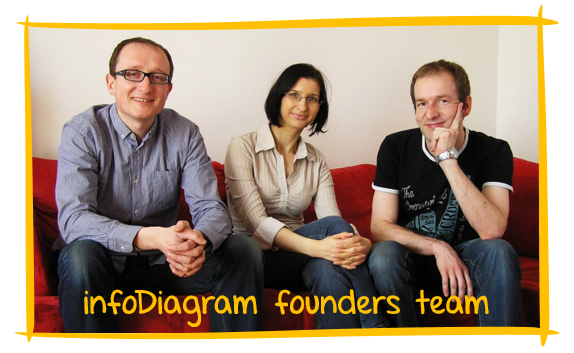 Founders team: Marcin, Izabela and Peter. It all started in winter 2009 when I (Peter, the guy on right) have met Marcin at a startup conference. I knew him from before; we used to work at the same company. After some years of experience in various businesses, we were both ready to explore a new business idea. So we sat down and made a list of ten businesses we could do together. Because we both were happy fathers already, we knew we want a long-term stable business idea. Something we both would feel passion about and something we could develop in synergy with our families. You know, there are many of these startup accelerators, where you work 12 hours a day for three months, and then you see if it works. Well, that was not for us. We preferred to work at a slower pace, not in a rush to create the long-lasting mature business. Hence, the idea of infoDiagram came out as the winner. As we both had experience with business presentations, and we appreciated clear communication. Also, we wanted to create something that helps other people (unlike all those gaming startups, for example). Later our graphic design guru Izabela joined in, to bring more high-quality designs on the board. So that was a cradle of infoDiagram idea. Long story short, months passed with daily evening developments of the website, weekly meetings, monthly designing new hand drawn slides graphics. And today we have it – well working, stable growing infoDiagram – hopefully appreciated by you – our visitors and customers. We are not Mark Zuckerberg yet (not sure if we want to be). We love what we do – it gives us satisfaction. It allows us to keep work-family balance, to be with our kids and work from home. To be creative and be useful to others. There are hundreds of things to do more. But we love it and look forward to the future. PS. If you want to join our team or got a question, tweet us (@infodiagram) or drop us a line. We are open to new ideas and cooperation.